BACKGROUND: Water in lakes, rivers, and swamps often contains suspended and microbiological impurities that make it unfit for industrial and human use. Such water must be cleaned using a water treatment plant before use. An important stage in the water treatment is Filtration. FILTRATION PROCESS: The water passed through filter where all suspended matter, organic impurities and bacteria are removed. 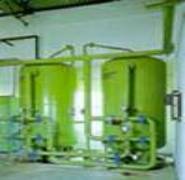 The filter can be made of Green Sand, Gravel or Manganese. Multi grade filters makes use of a coarse and fine media mixed together in fixed proportions to form a filter bed with appropriate pore dimension to block both large and small suspended particles in the water. These filters can be used to achieve a flow rate from 0.2 m3 to 250m3. The filtered water contains 50-25ppm of suspended solids. The filter requires very little maintenance. Normal untreated water can be used to wash away the waste matter from the filter.